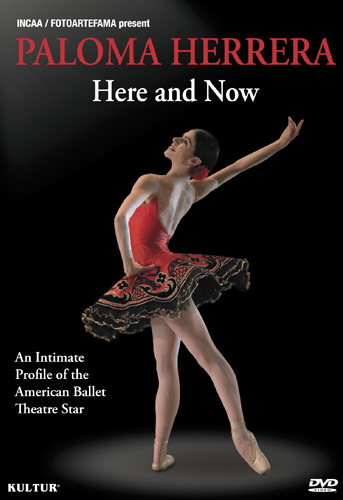 "Paloma Herrera: Here and Now" is an insightful documentary film that shows different aspects of the personal life and career of the ABT Prima Ballerina. The film includes interviews with Paloma Herrera in New York and Buenos Aires, the testimony of her teachers, and clips of her dancing in rehearsal and in performance. "No dancing around the news that the DVD release of Paloma Herrera: Here and Now (Kultur) is big news. This insightful documentary shows different aspects of the career and personal life of the ABT Prima Ballerina. From her start as a prodigy is South America to her invitation to study at the English National Ballet in London by no less than Natalia Makarova herself. The film includes interviews with Herrera in New York and Buenos Aires, the testimony of her teachers, and clips of her dancing in rehearsal and in performance.